At the end of a narrow road with a quintessentially French name – Rue de Château – the life-guarded beach at Saint-Pierre-en-Port is pebbly but picturesque affair. At each side, great white cliffs climb to grassy tops where a handful of houses overlook the bay, while in the waters swimmers dot the waves. Families love it and campers of every age make their way here at some point during their stay. After all, the best of the local campsites is just a few hundred metres up the road. And, having spend all morning enjoy views from your tent out across the open blue, it’s only natural to want to take a dip. 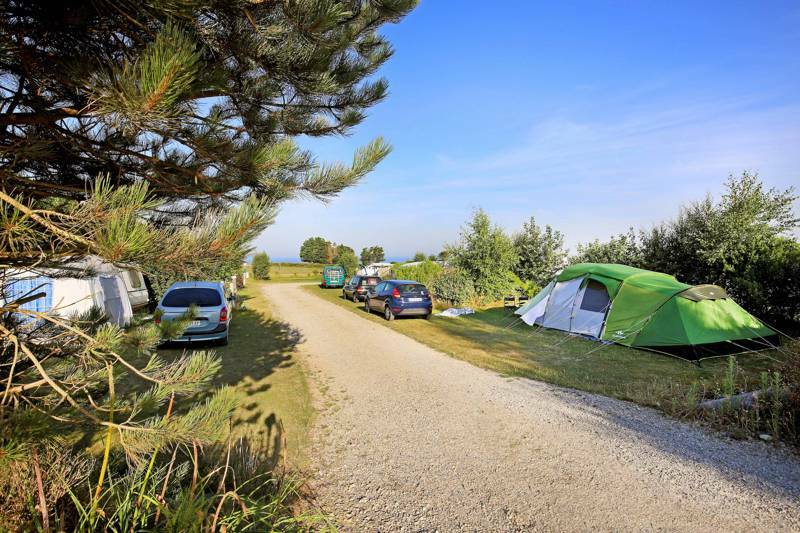 Camping les Falaises has been in the village of Saint-Pierre-en-Port for years but has recently come under new ownership, investing in the facilities along the way. There are a couple of modern wash-blocks with all the essentials and a friendly reception building where you can leaf your way through pamphlets about nearby museums in Dieppe, fish markets in Fécamp or the major attractions in the cathedral city of Rouen (an hour away by car). The views, of course are nothing new, and the walk, from the campsite along the cliff tops is as spectacular today as it surely ever was. When the sun’s out the sea that stretches beyond is a beautiful brochure-blue. The campsite doesn’t have a shop. There’s no need for it. Instead, the village has a small supermarket and the essential amenities you need, while a small tourist office next to the town hall can supply you with any information not found at the campsite. For most campers, it’s the beaches and the waterfront that attract, but there’s a host of good museums to be found nearby, too, and, further north, the famous monuments and historic sites of the D-Day landings. 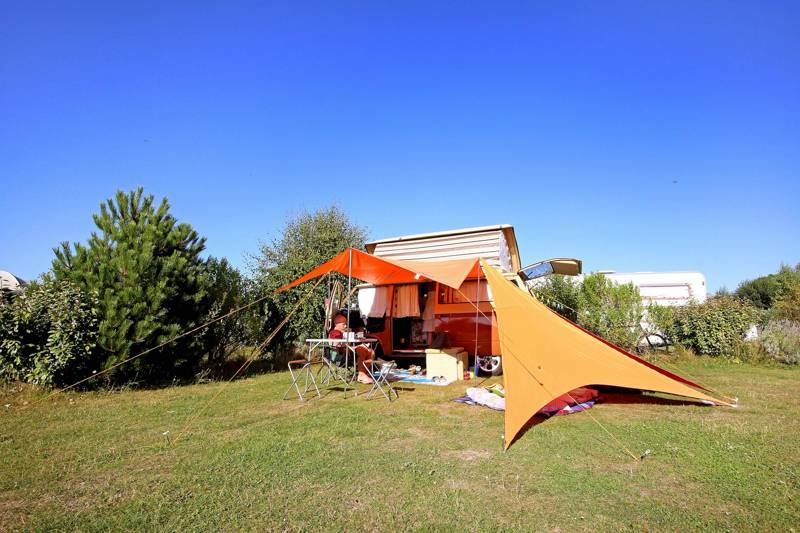 The campsites proximity to Le Harve and Calais – an hour to the former, two and a half to the latter – also make it a shamelessly convenient stop-off during longer journeys around France. Les Falaises campsite invites you on a journey through Normandy, to discover the play of light on the surrounding landscapes and the cultural wealth of the Côte d’Albâtre.Located in Saint-Pierre-en-Port in the Seine-Maritime, stay on an unspoilt campsite, with breathtaking views of the sea. A holiday in the heart of Impressionist Normandy, with its coastal towns and 130 km of coastline, carved out by the ocean. Wherever you travel, from Mont-Saint-Michel to Tréport via Deauville, Le Havre, Honfleur, or the little villages of the Pays d’Auge and the Perche, the Normandy coastline offers endless delights. The region is steeped in emblematic sights, such as the landscapes of Etretat, and the ports and cathedral of Rouen, which inspired Monet and the impressionist painters. For latest availability and best prices for Camping les Falaises , please use the Date Search above. We had a lovely stay at this campsite. The pitches are large and tidy, it is perfectly located, walking distance from beautiful cliffs. Every morning you can order bread and pastry which are delicious! We would definitely come back! Loved the location - close to a quaint little village which has 2 shops, plus a bakery, butcher and cafe/restaurant. You can get to the beach within about 15 min walk, it is very steep but worth it! Slightly bigger campsite than I imagined, 2 toilet/shower blocks plus activities like ping pong and boules. Decent sized pitches. Only negative is the toilets... they’re typical French toilets without toilet seats (yuk!) and there are even some of the very old squat toilets!!! The staff is young, helpful and really kind. We relaxed immediately. The back of the site is really cool, really nature-like and pleased us as young “cool” campers ! We will come back for sure! 170 pitches, most of which offer stunning ocean views. 170 pitches, 'comfort' pitches have electrical hook-ups. 2 washrooms, each open 24hrs a day – showers, toilets, sinks and washing up areas, plus a washing machine and dryer (tokens on sale at reception). Fridges and BBQs for hire. Motorhome service area. Pétanque court and table-tennis table. Fresh bread delivery every morning (place your order the evening before). Footpath to Saint-Pierre-en-Port beach at the bottom of the campsite. Saint-Pierre-en-Port beach is at the foot of the campsite (best reached by going through the village though), while the village is 300m away and has all the main commodities – a small supermarket, a butcher, bakeries, a restaurant and a post office (as well as a tabac selling the all important postcards). Both Saint-Pierre-en-Port and the beach at les Grandes Dalles (1 mile) are good for swimming, and the pebble bays at Dieppe, Etretat, Veules les Roses and Fécamp are all within driving distance. Fécamp, in particular, is less than 20 minutes by car and has plenty of historic monuments to busy you, including the ruined buildings of a Benedictine abbey, a 13th century water tower and beautiful old houses in Hallette neighbourhood. There's also 6 different (small) museums. There's fresh bread delivery to the campsite each morning (order the night before) and a supermarket and small shops in the village for supplies. There are a coupe of bar-tabacs that offer quick food but next to the tourist office and the town hall there's a hotel-restaurant that serves good food. For more choice, though, head into Fécamp or Dieppe where, unsurprisingly, these port towns have top notch fish and chips.